Central America is much smaller than the land encompassed within the borders of Canada and the USA. After a brief look at a map, my rough guesstimate is that the territory from Guatemala and Belize south to the Darien gap is roughly equal to New England, or Florida and the eastern parts of Georgia and the Carolinas north to the Virginia line. Given such limited geographical dimensions, one might be tempted to assume that Central America is pretty much the same, that the region is fairly homogenous in a number of ways. Although the countries of Central America certainly share some cultural and biogeographical characteristics, the area is a lot more diverse than most would expect. 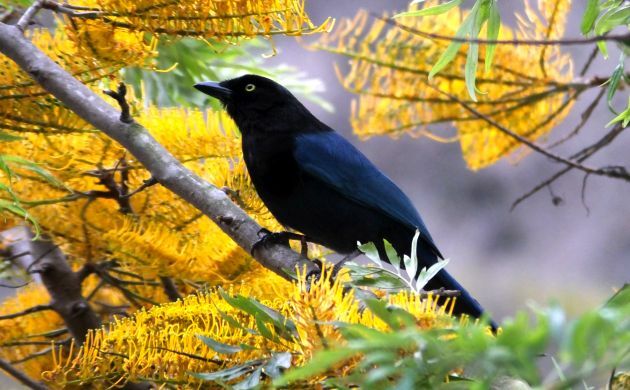 In addition to Spanish, several other languages continue to be spoken, the pines and cypress trees of the Guatemalan highlands only occur as introduced species once you travel south of Nicaragua, and dozens of bird species that occur in Costa Rica and Panama don’t even make it to Nicaragua. 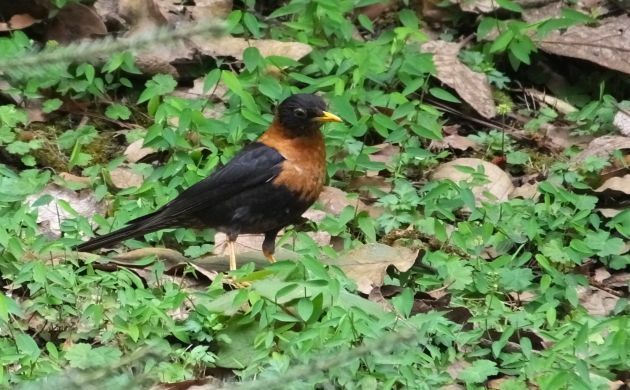 Likewise, various birds that reside in northern Central America, won’t be found flying further south. The Rufous-collared Robin is one of those birds. Recently, I was witness to the differences in birding between the northern part of this region and Costa Rica during a week of guiding in Guatemala. Finally, I made it to the main gap in my birding life north of Colombia! The experience was one a long time in the waiting ever since I skipped over the highlands of Chiapas with a flight from the Yucatan to Costa Rica so many years ago. That flight had left out any chances of birding the forests where the Pink-headed Warbler and a few other much wanted megas reside. The warbler that looks almost like a holiday ornament, the dino-bizzaro Horned Guan, the monster Chestnut-sided Shrike-Vireo all lived there and in finally seeing them, more life goals have been achieved. As Black Elk might say, “Hoka Hey”! A long hike for a mega bird: The Horned Guan hike out of Tarrales Reserve is infamous and with good reason. Imagine hours of constant step after step hiking uphill followed by step after jarring step of heading back down, hopefully after seeing the feathered unicorn, and you should get the picture. Despite what the muscles in our legs were telling us, our hike was actually a bit less strenuous than the usual route. Luckily, our one guan was also lower than expected and thus quickly removed a lot of anxiety from the “stroll” even if the look was all too brief. In contrast, Costa Rica doesn’t have any challenging hours of hikes to look for a weird unicorn-bird. I should have made that triumphant, fire-in-the-eyes exclamation of “Hoka Hey!” high up on Toliman Volcano after seeing the guan but I guess I was too busy looking for other birds to remember to do it. That, or was trying to catch my breath after the infamous climb. 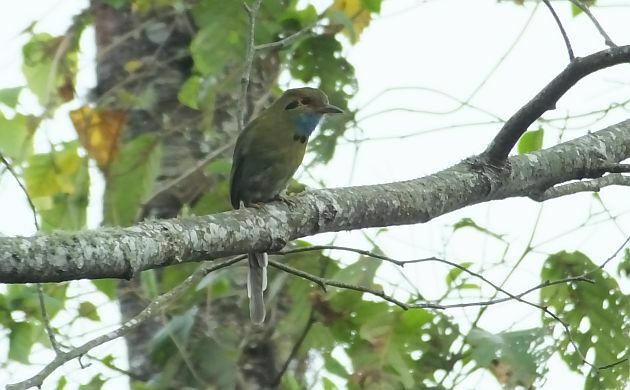 Either way, I’m glad I didn’t yell because then, I might not have seen Blue-throated Motmot and Chestnut-sided Shrike-Vireo in short succession. Motmot a la blue throat. I was pretty keen on the shrike-vireo too. It calls like a weird, screaming mini-cat! Much less humid than Costa Rica: While Guatemala does have its humid parts, and Tarrales was somewhat humid, the rest of the highland places we visited by much drier than most of Costa Rica. We could easily feel the difference in the air, the scents were different, and of course many of the birds were also different. 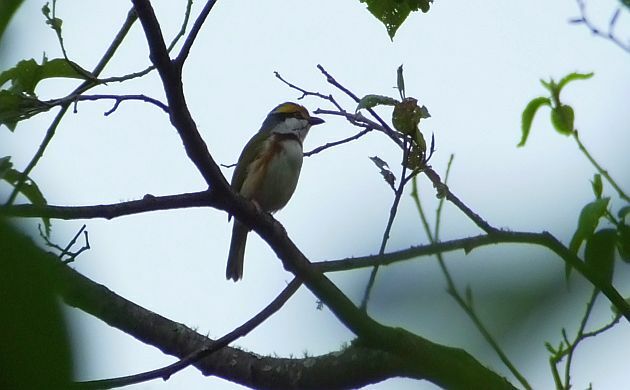 Warbling Vireos, Western Tanagers, and Least Flycatchers: This trio of birds were pretty common at a few sites. In Costa Rica, although the tanager is locally common in some areas, the vireo and flycatcher are rare migrants. It was nice to see several of each at Tarrales. Guatemala is much colder than Costa Rica: We were told to be ready for pretty cool weather during highland birding. How true this was! There are only a few cool sites in Costa Rica and even those have slightly higher temperatures than Guatemalan hotspots like Tecpan, Cerro Alux, and other highland areas. It was a pleasant change to bird while wearing warm clothes without it being too hand-numbing cold! 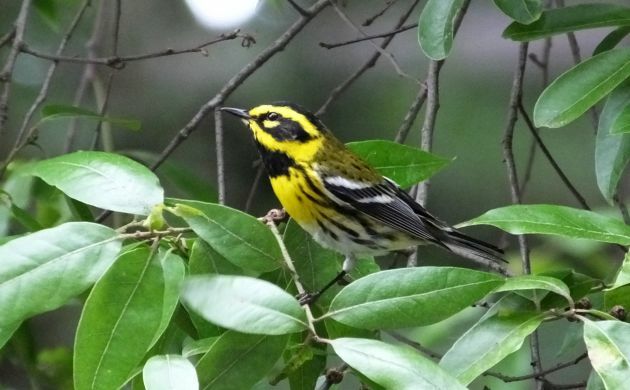 Highland birding, there be tons of wintering Townsend’s Warblers in them thar trees! It’s easier to see more birding sites in Costa Rica: Given the much larger size of Guatemala, this only makes sense. However even taking that into consideration, more sites in Costa Rica are still more accessible because of easy access to national parks and other protected areas, as well as plenty of roadside birding opportunities. In Guatemala, frequent speed bumps made for slow drives, and access was limited to large private farms and one or two protected areas. That was fine though, it still worked out well! More jays and orioles in Guatemala: We do have some of these fancy mid-sized birds in Costa Rica but not nearly as many as Guatemala. On the jay front, we were entertained by Steller’s in the pines, a few Black-throateds in high cloud forest, White-throated Magpie-Jays at Tarrales, and Bushy-cresteds elsewhere. Travel to other parts of the country and four or five others can also be seen. As for the orioles, we were happy to lay eyes on Spot-breasted, Altamira, Black-vented, and Bar-winged along with the more familiar Orchard and Baltimore Orioles. Fewer tanagers: Many more member of this technicolor family occur in Costa Rica. That said, Guatemala still has a doozy or two including the mega Azure-rumped! Although our local guide really did his best to help us see one, our one morning turned out to not be enough time to get it. In any case, a good excuse to return to Tarrales where the birding and hospitality were wonderful! 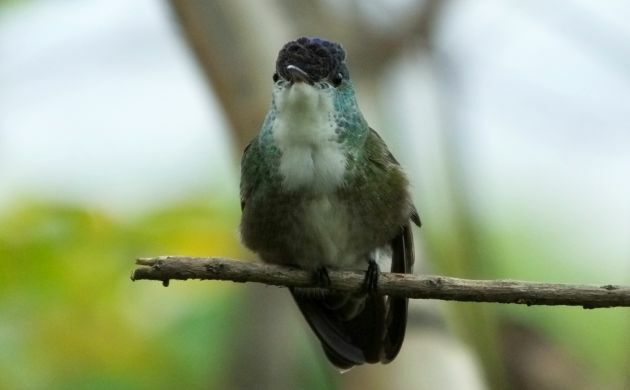 Anti-social Hummingbirds: I’m sure it was just a fluke or something to do with the time of year but compared to Costa Rica, we had fewer hummingbirds than expected. We did see some here and there but just not nearly as many as we had hoped. It could also be that several target species just weren’t as abundant in the places where we birded (which tended to be on the dry side of things). But, I do stick by my anti-social designation. It was that or anti-birder sentiment because nearly every time we espied an enticing hummingbird, flying or perched, it zipped off to oblivion half a second later. We would wait for it to return in vain again and again until we finally felt like the tiny iridescent birds were involved in some unproclaimed conspiracy. Oh well, another reason to return, maybe this time with a peace offering in the form of sugar water? All that unfriendly behavior made this Azure-crowned Hummingbird the most welcome and wonderful hummingbird in Guatemala. There’s much more than could be said, especially concerning similarities, nice hospitality, great food, and cool sites, hopefully I can write about that and more after another visit to Guatemala. Many thanks to Cayaya Birding for excellent organization and guiding for the trip.